Dr Warren Farrell, along with co-author Dr John Gray, wrote The Boy Crisis: Why Our Boys Are Struggling and What We Can Do About It published by BenBella Books in March 2018. You can find him on Twitter or Facebook. There’s an uncomfortable parallel out there that some campaigners don’t like to acknowledge. You’ve probably seen one side or other of the parallel on Facebook or other social media, depending on what type of self-confirming political views the algorithms think will keep you clicking on ads for as long as possible. One side is a variation on the theme that armed toddlers, or lawnmowers, or insert other ridiculous cause of death of your choice, that all of these kill more Americans than Islamic terrorists posing as refugees. And it’s true. You are literally more likely to be killed by a toddler who gets hold of a gun. Murders by Islamic terrorists in the US have been vanishingly rare in recent years; that depends somewhat on definitions, but Donald Trump Junior’s Skittles bowl tweet was a good example of a misperception. 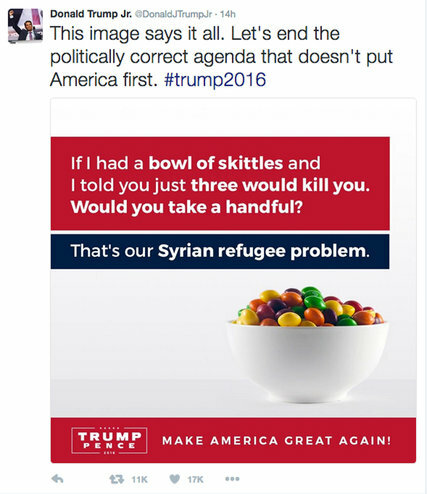 He compared accepting refugees from the Syrian war to eating from a bowl skittles, one of which is poisoned. In fact, as was pointed out, to represent the stats accurately, you would need a bowl of skittles far bigger than an Olympic-sized swimming pool. You would be certain to be dead of diabetes long before you found the poisoned skittle. A rebuttal from the other side of the aisle is strikingly similar. The March for Our Lives was in Washington on Saturday, following the Marjory Stoneman Douglas High School shooting, among others; gun-rights advocates make the same point that advocates for refugees make whether they’re talking about school shootings or the shooting of black men by white police. Despite the attention that these incidents get, statistically speaking, they’re irrelevant. It’s true that police kill black men proportionally more than white men, but both statistics are vanishingly rare compared to the overall homicide rate, and particularly compared to the homicide rate in the mostly African-American impoverished communities, where a big chunk of the fatal police shootings also happen. If numbers are your only driver of concern, then the murder of black by other black men is, by a mile, what you should be most concerned about. And, by the way, if numbers are your only driver of concern about gun violence, you shouldn’t be talking about homicide at all. Most gun deaths are suicide. It’s no accident that, depending on what side of the culture war you are on, you get much better about understanding statistics and proportionality, depending on which issue is being discussed. If you’re on the left you understand the remoteness of the threat of terrorism in the US, but not the remoteness of the threat of police shootings. If you’re on the right, you can put police shootings in the context of tens of thousands of gun fatalities, and a white racist who shoots people at a black church is just a meaningless aberration, but a murdering jihadist somehow represents all Muslims. And before I get too clinically driven by mathematics here, it’s worth asking, is the bodycount the only thing that makes these incidents important? Beds – yes beds – kill 450 people in the US every year, just by people falling out of them, and that’s not counting 1.8 million injuries serious enough to trigger a trip to the emergency room. Does that mean that we should be less concerned about anything that claims less than 450 lives a year than we are about beds? Beds account for far, far more American deaths than terrorism. Should be we marching and saying Sleeping Lives Matter? Should we have War on Mattresses? Should we all sleep on the floor? First of all, it’s worth noting that charismatic causes of death get far more notice than others. That isn’t entirely irrational. The slaughter of children in their classrooms gets far more attention than random accidental deaths in the home. Police are the icons of protecting the community. When they appear to carelessly of vindictively kill an unarmed citizen, that provokes outrage. Gang members murder each other. That’s what they do. We are right to be angrier when police seem to act like gang members. And terrorist murders are designed to be spectacular, to attract our attention and to trigger us into over-reacting. It’s also worth noting here that there is slicing and dicing of the stats done by all sides here. People who point out the relative rareness of terrorist deaths usually make sure to start counting at some point after September 11, 2001. And gun-rights advocates are always careful to talk about small subsets of gun fatalities, such as school shootings, or murders with assault rifles, or mass shootings, as though people killed in other places or with other types of guns, or on their own weren’t just as dead. But even when they are correct and valid, another reason that raw fatalities are not a good indicator is that we encounter some situations much more frequently than others. At 450 deaths a year, does that mean that beds are dangerous? Of course not, we spend a third of our lives in bed. It would be astonishing if it wasn’t associated with some deaths. Also, a look at the raw figures would indicate that swimming with sharks is not as dangerous taking selfies. Eight people a year are killed by sharks, compared to 12 taking selfies. But that doesn’t make sense. Billions of selfies are taken each year; of people killed in accidents, some of those are bound to have died because of distraction; and of those, some will have been distracted by taking a selfie. That doesn’t make swimming with sharks safe either, that’s eight deaths in a comparatively rare activity. And here is where part of the outrage that seems to defy statistics is actually justified. The killing of people who never wanted to be in harm’s way is particularly egregious; even more so when it is someone who people think we should be particularly careful with. That’s why school shootings get all that attention, and are right to get that attention. Those kids and their parents never did anything to even slightly put them in harm’s way. They did everything to keep out of harm’s way; but harm came to them. Their deaths are so much more charismatic than just another gang murder over just another drug dispute. And most African Americans have nothing to do with crime and drugs, so they don’t see that as a relevant risk to them. But African Americans can’t stop being black, and if that is the risk factor that they see for getting shot by a twichy cop, then that’s relevant. And even if it’s vanishingly rare, violence from terrorists is terrifying partly also because of its randomness, it’s totally outside the control of the victim. There is a mountain of psychological research that shows people are much more scared of things that they can’t control. That’s why driving is much more dangerous, but far more people are scared of flying. But what I’m really interested in here is the real reasons. Go back to Don Junior’s ludicrously wrong tweet about the bowl of skittles. Really, it didn’t matter that he was wrong about the proportions. Because he wasn’t talking about proportions. He wasn’t talking about the supposed poisoned skittle. He was dehumanizing all refugees by talking about people as pieces of candy. And the people who support him don’t care that he was wrong by so many orders of magnitude, because for them, he wasn’t wrong. He, and they, don’t see refugees as individual human beings, they see them as an undifferentiated mass. And, I think, for Black Lives Matter, fatal police shootings are a convenient hook to hang a whole load of other grievances on. In some cases they might be justified grievances about less serious, but still highly corrosive, way African Americans are treated by law enforcement. But they have a real blind spot for the effects of crimes committed by and against young black men.